Thursday, Thanksgiving Day, some Americans remembered the religious and not-wholly-commercial base of this national holiday. The religious element bade citizens to look backward with thanks and forward with a spirit of newness and resolve. Yesterday, to liturgically-minded millions of Christians, was the first Sunday of Advent, a kind of New Year's Day. It also suggested openness to the future. Last Tuesday, however, Pope Francis, observed and spoke of Europe's "malaise." Headlines above a November 25 article by Andrew Higgins in The New York Times fleshed out the "malaise" sense: "At European Parliament, Pope Bluntly Critiques a Continent's Malaise" and "Pope Speaks of Lost Vibrancy." Then, on page 10: "Pope Delivers a Somber Critique of European Malaise: A 'Message of Hope' that amounts to a failing grade." So it's "malaise" time. We older Americans have been there before. On June 30, 1979, then-President Jimmy Carter gave a "Crisis of Confidence" speech which did not use the word "malaise," but most of the reporters and analysts did. While, contrary to many rememberings, his presidency did not end thereupon: polls saw a momentary 11% boost. But then... the fall. And we've been there before through the career of Pope Benedict XVI, himself of Central European background, ethos, and outlook, who scolded European Catholics (especially), and urged retrenchments of a sort. To little avail. The Argentinian Pope Francis also spoke now of "hope" and imparted it, even as he handed out "failing grade" report cards to Europeans. But his analysis was applicable to North Americans, too. Sightings has spent more weekly columns than we might have liked to, on stories of religious and cultural "decline." While the decline and near-fall of Catholicism in once (and recently) super-Catholic Quebec, Ireland, and -- to a lesser degree -- Poland are not matched to the same degree in the United States, we are hard-pressed to find "up" or "level" stories to match or counter "down" headlines here. Hoping not to be done in by the suggestions of polls or believing in what Groucho Marx called our "own eyes," we will be spending much of the time reporting on stories which do some justice to the signs of religious acts of justice and mercy where they are in place. For the short pull, however, it is worthwhile to listen to the Pope: "In many quarters we encounter a general impression of weariness and aging, of a Europe which is now a 'grandmother,' no longer fertile and vibrant... The time has come for us to abandon the idea of a Europe which is fearful and self-absorbed." In another speech on the same day, Francis told the Council of Europe that it was his "profound hope that the foundations will be laid for new social and economic cooperation." He pointed to the poor, who ask "not only for the food they need for survival,...but also for a renewed appreciation of the value of their own life, which poverty obscures...."
American headlines have recently been devoted to the sad decline and fall of Bill Cosby, the signals of civic breakdown and racial conflict at Ferguson, and the anomie mixed with pointed and pointless rage displayed by many of the protesters. Such headlines obscure the many efforts by some in legislatures and more in exceptional religious communities who are addressing issues of inequality and injustice. These have to compete with those manifesting anger and issuing in violence. Sightings will watch for examples of the imaginative, creative, and sacrificial movements, leaders, and participants in causes, rather than merely victims of malaise. Higgins, Andrew. 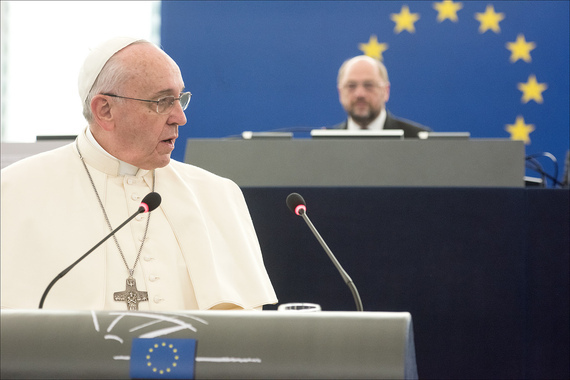 "At European Parliament, Pope Bluntly Critiques a Continent's Malaise." New York Times, November 25, 2014, Europe. Klein, Ezra. "Jimmy Carter's malaise speech was popular!" Washington Post, August 9, 2013, Wonkblog. Allen, John, Jr. "How different are Francis and Benedict?" Crux: Covering all things Catholic, November 26, 2014, Church Analysis. Image: Pope Francis addressing the European Parliament, November 25, 2014 © European Union 2014 - European Parliament. This post originally appeared in Sightings, an online publication of the Martin Marty Center for the Advanced Study of Religion, University of Chicago Divinity School.